Commonly known as Teatree, due to the practice of early European settlers using the leaves of some species as a tea substitute. 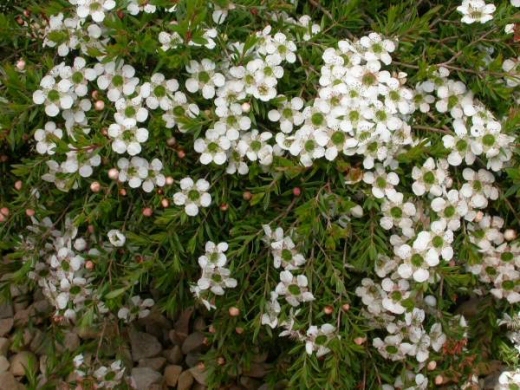 Leptospermum is a genus of over 80 species, with all but a handful occurring in Australia. This group of plants seems to fit the bill for whatever application you'd like for your garden space. 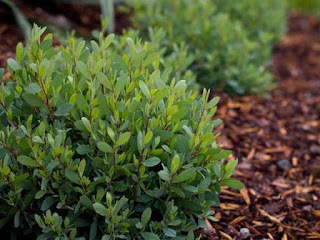 For example 'White Wave' pictured above, is a lovely dwarf, cascading shrub with small mid-green leaves with masses of frothy white flowers. This Liptospermum is just perfect for either cascading over retaining walls or banks but also ideal for use as a container plant, such a versatile plant. 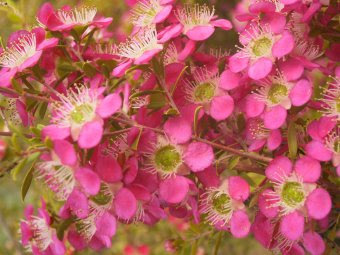 The beautiful 'Tickled Pink' pictured above, was developed by Bywong Nursery at Bungendore and is a hybrid between Leptospermum polygalifolium 'Cardwell' and Leptospermum 'Rhiannon' a gorgeous large (20mm) pink flower with a green centre. 'Tickled Pink' should do well in the Coffs Garden based on the characteristics of its parents. If you are looking for an excellent hedging plant 'Fore Shore' (see below) or 'Shore Tuff' might be the way to go. Both are terrific little plants and look fantastic when trimmed into a hedge. Leptospermum are easy to propagate from cuttings, which is of special value in perpetuating strains or varieties of plants that are not very viable from seed. Pests & Diseases: The main problem is caused by small white scale insects which appear in fairly large numbers and affect growth rates. These can be controlled by the use of white oil. The other problem which may be experienced is with leaf and twig webbers. They bind a mass of leaves and twigs together from where the caterpillars emerge by night to feed on the leaves. The best way to treat these is simply to cut them off and place in the green bin.